We knew it was coming, but what some might not have expected was the double digit climb. The average tuition at a four-year public university is up an alarming 15%. And this increase in indicative of just two years. Blame state budget cuts. Worse, some state universities have raised their tuition a whopping 40%! If you’re a college student attending school in Georgia, California or Arizona, your wallet is definitely taking a hit. The true tragedy is it appears a college education is becoming out of reach for far too many young people. Every year, the Department of Education reviews the dynamics associated with secondary educations. Everything from affordability to community involvement where college campuses are located are included in this report. This year, it found what it refers to as “significant price increases” throughout the nation. The real shocker, however, is that some schools now boast tuition at levels twice than what it costs to attend Harvard. The report cites one film and art school in Florida, Full Sail University. It touts a $43,990 annual price tag. This includes the average price of tuition, fees, books, and other expenses. This number also takes into consideration any associated scholarships or grants. By contrast, using the same considerations, a Harvard student pays $18,277. Arne Duncan, Department of Education Secretary, is encouraging families to be smart about saving ahead of time. Preparation is key, he insists. He also points out another important fact: almost half of all states cut spending associated with higher education. Since this is the most relevant factor behind tuition increases, news that more cuts are expected will only result in even higher tuition costs. A new law passed in 2008 requires lists be released for public viewing. On that list, colleges must provide the costs associated with tuition and any applicable fees. States must provide thee average net price at public, private and for-profit colleges and universities. This law was passed in an effort to keep parents and students in the loop. If there’s any good news, it’s that President Obama issued an order that will simplify the application process for anyone applying for student loans. 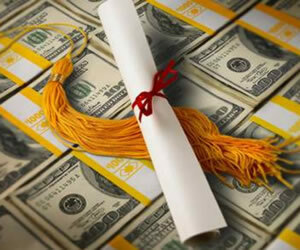 It will place a cap on how much a student or his family is required to repay on a monthly basis. It’s based on the applicant’s income level. As if the tuition increases aren’t bad enough, there are other trends that must be factored in. First, more college students are graduating with considerable credit card debt. Even as the 2009 CARD Act sought to make it harder for college students to qualify for a credit card, it hasn’t eliminated the problem in its entirety. As these young adults prepare to graduate, they do so with the thought in the back of their minds that they’re leaving school with overwhelming debt and they’re entering a work force that might not have a position for them. So, they turn to their credit cards to cover their bases. This, of course, only worsens the situation. Their parents aren’t always in a position to lend a helping financial hand because it’s not uncommon for parents to have shouldered at least part of their child’s education via their own credit cards. One Penn State graduate revealed in the report that his total tuition amounted to $50,000 for his four years. He graduated this past year with student loans of more than $25,000. He admitted he had no idea how much debt he’d be shouldering until he graduated. For those entering college, they too have no shortage of worries. Housing is one of them. When the costs of housing, books and other fees are factored in, the annual price tag can rise dramatically – sometimes up to $5,000 or more. As a nation, we need more college graduates in order to stay competitive in the global economy. But if the costs keep on rising, especially at a time when family incomes are hurting, college will become increasingly unaffordable for the middle class. If you’re wondering where the solution is in that statement, you’re not alone. Even as this report was made public, those on Capitol Hill are battling and trying to beat a July 1 deadline that, if not met, will double the interest rates on student loans. It will affect close to 7.5 million students. If this deadline passes with no resolution, it’s likely to set off a cycle that will mean more extensive rises in tuition to offset lower enrollment. The lower enrollment will be due to the inability of families to afford those higher interest rates. For many families, traditional loan products are out of reach, so they’ll be forced to rethink their child’s educational futures.